This gallery contains miscellaneous photos in various locations such as Paris and Nashville. 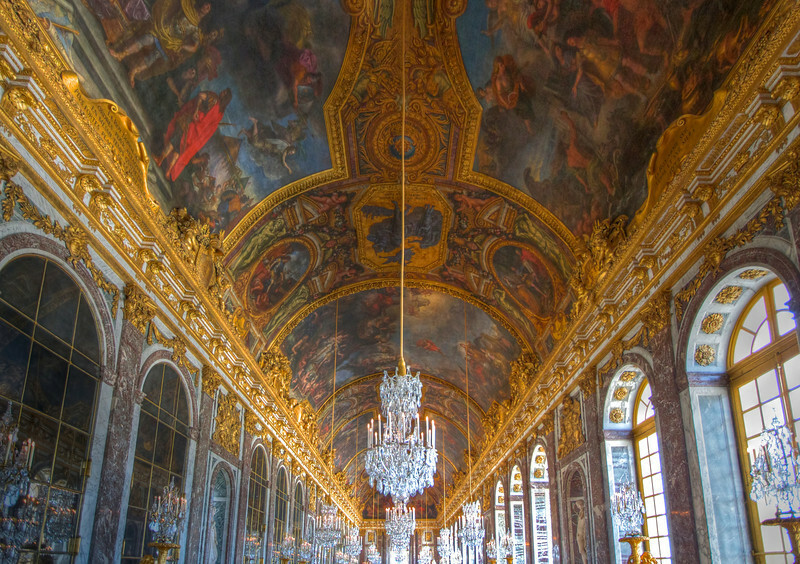 The Hall of Mirrors is the largest room in the Palace of Versailles and overlooks Versailles Park. The Hall of Mirrors was constructed between 1678 and 1684 and designed by Jules Hardouin-Mansart and decorated by painter Charles le Brun. The Hall was the setting of royal celebrations.It was the setting for the proclamation of the German Empire by Otto van Bismark in 1871 and the location of the signing of the Versailles treaty, which ended World War I.
Versailles does not allow backpacks or tripods so all of my photos were handheld. Fortunately there is a reasonable amount of light. This photo is a result of merging three photos in an HDR process in Photomatix; 10 mm (16 mm with 1.6X crop factor), 800 ISO, f3.5 with speeds of 1/250 (-2), 1/60 (0), and 1/15 (+2).